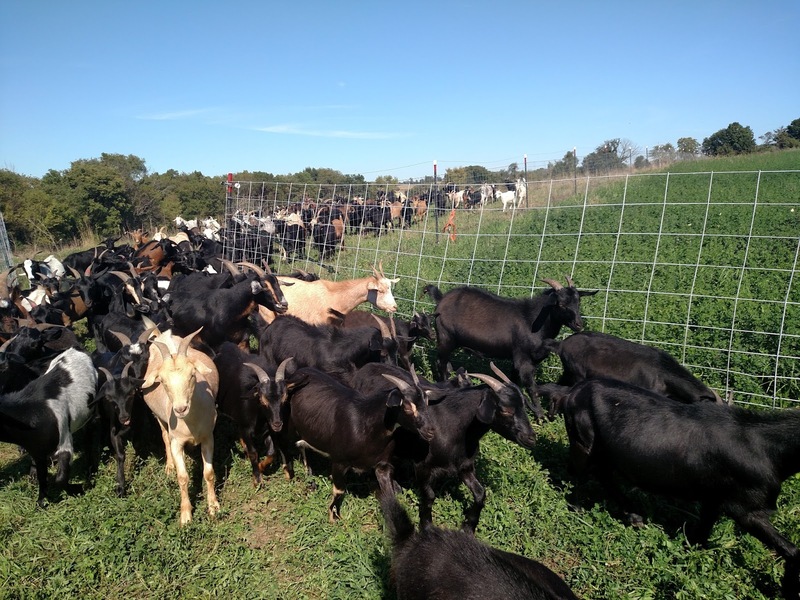 Green Goats is a land restoration company founded by Kim Hunter of Monroe, WI. In last week's article we looked her business model and an example jobsite, a golf course in Chicago. Now let's return to the golf course for a 'before and after' look at the goats' handiwork. 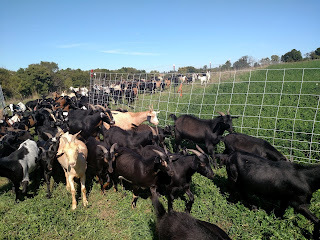 We'll also see some cell rotations at a different jobsite, one ideal for goats. Lastly, as my two weeks with Kim draw to a close, it's time to share her wealth of wisdom and experience in herd management. 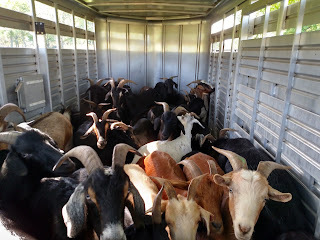 Goats cleared most of the biomass. 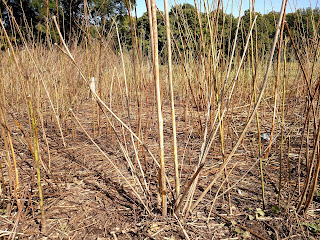 But the stalks of many herbaceous plants become too thick and woody if allowed the full season of undisturbed growth (mid-September pictured here). 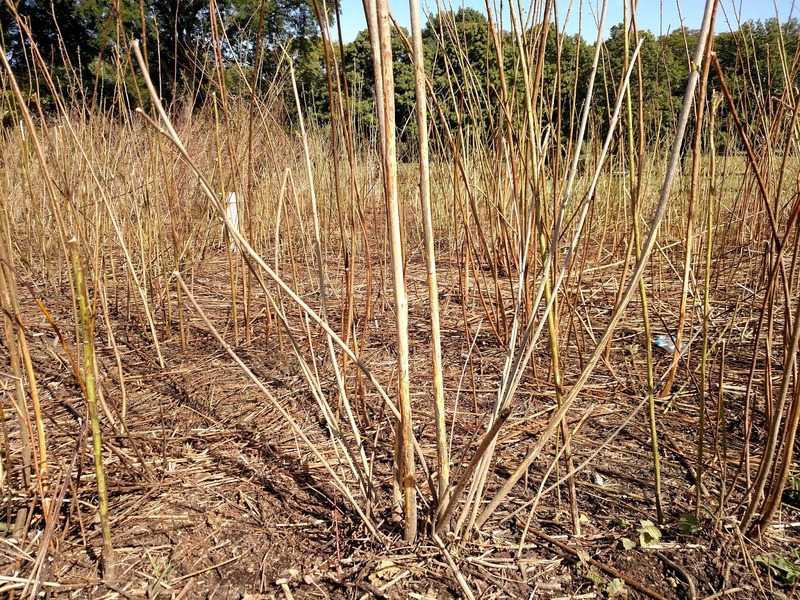 For total clearance sites should be grazed earlier in the summer or multiple times throughout the season. Goats are paid to eat on a jobsite. But back at the farm each unemployed goat—and the whole herd in the off season—costs energy and money to feed. Kim balances these demands between grazing on her pastures and purchasing hay. 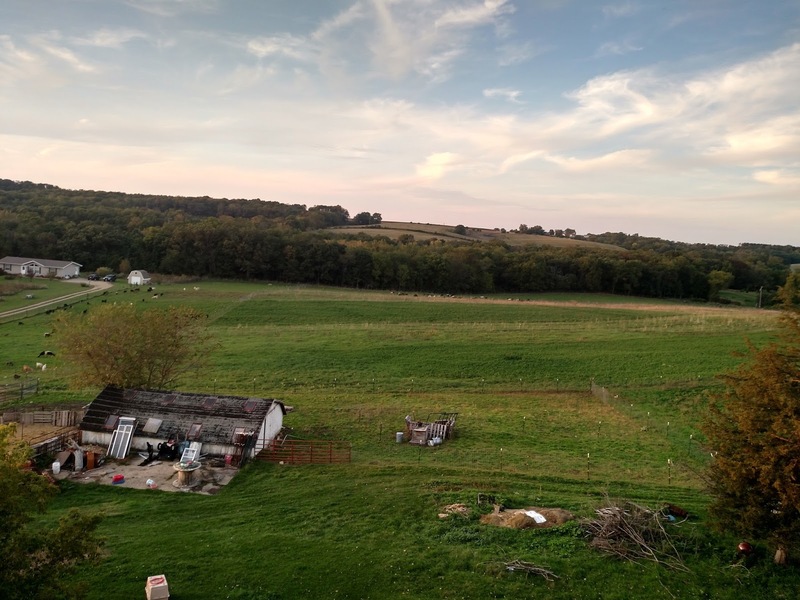 Up until 2012 when Kim purchased it, Fossil Ridge Farm was strip-cropped with corn and alfalfa, and two decades before that it was pasture for dairy. It has a history of soil erosion, in a region that already has weak geology for farming: 2-3 inches of topsoil on ancient bedrock. "This land should've never been plowed," Kim often admits. Her 10 acres of pasture are lush in some patches, rocky or covered in ragweed in others. 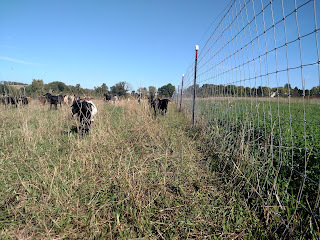 Overall the soil quality and vegetation has improved under Kim's management, by seeding legumes and grasses, adding hay and manure, and rotationally grazing. Grasses, clovers and weeds on the left. Alfalfa on the right. Prices can be volatile. Bails were $128 each during the drought of 2012, and only $38 this year. 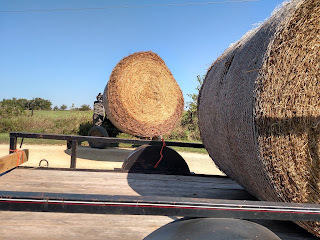 Kim unloads the bails at the tops of hills, and rolls them out to the herd. Kim claims goats will waste hay no matter what type of feeder she constructs. So at least the rolling method is easy. 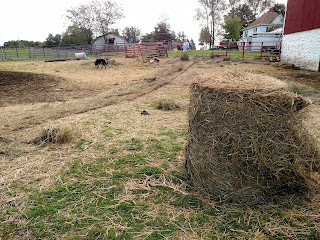 Plus she can roll it towards patches of poor soil, where the leftover hay boosts organic matter. The herd's healthcare is another output of money and labor, one that grows proportionally to herd size. Kim clips hooves and deworms roughly three times a year, and provides vitamins and other care as needed. Hoof clipping - Overgrown hooves can lead to hooftrot, pain while walking, and possibly starvation. Rough rocks or cinder blocks let goats trim hooves naturally. Eyelid check - Dark pink means adequate blood flow. Light pink/whitish means lack thereof, which means anemia, which probably means barberpole stomach worms (haemonchus contortus, wiki). Dewormers - Ivermicten (see video below). If you have livestock you're going to have deadstock. Last spring the Zaytuna Farm PRI lost four goats (half their herd) after a WWOOFer fed them branches of 'poison peach.' He must not have known the tree by that name. One was likely rammed to death and died of a collapses lung. With its head stuck in a fence and bleating loudly, instinct for the other goats is to silence it before attracting predators. Tying knots without bows and leaning fences outward rather than inward help prevent horns from catching. Several have been lost over the years to bloat, which is a buildup of foam in the rumen caused by overeating, drastic shift in diet, or pH imbalances from mineral deficiency or ingestion of certain weeds. In Kim's case she times grazing to avoid wet alfalfa, which also causes bloat. Three died on a marshy jobsite during rainy season, either by some disease or nitrate poisoning. Kim wasn't able to determine with certainty. Autopsies are sometimes worthwhile if results can inform a change in herd management and save lives. However, the several hundred dollar fee, the 2-hour roundtrip, the uncertainty of useful results, and the death needing to happen within open vet hours, all make autopsies less common. 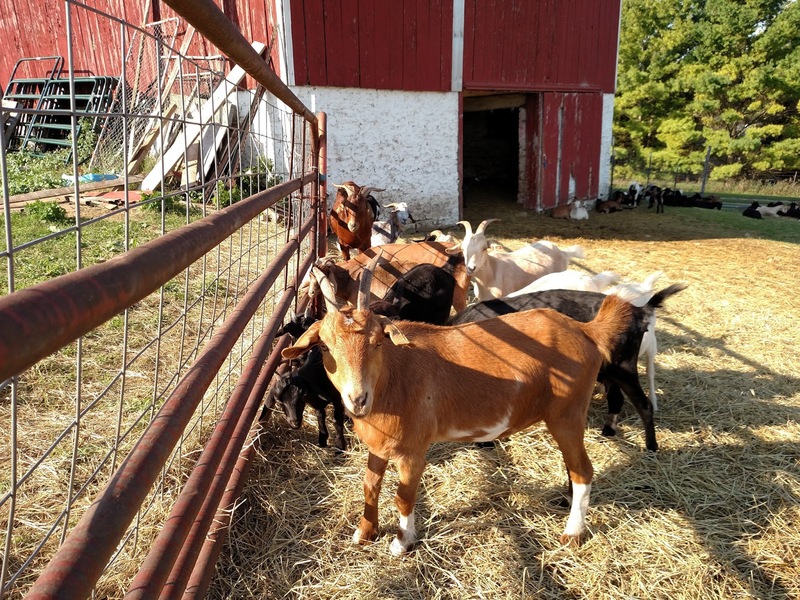 Overall, there seems to be less consensus among vets on treating goats compared to more common livestock. Have any valuable lessons on keeping livestock? Please share a comment below. The calm and slow handling of livestock, reduces expelled energy and chance of incident. Minimize the use of dogs, avoid the predatory linebacker stance, and leave the troublemakers at home, especially kids that may freak out and get stuck in a fence. Kim also recommends driving smoothly with a loaded trailer "or next time they won't get back in." Individual goats can have distinct personalities. Many have names; many are companions, especially ones that were bottle-fed, such as 'The Stinks,' an inseparable quintet that's friendly with humans but near bottom of goat society, and Hiccup, the current darling of the indoors. Pets make the lifestyle more enjoyable. Not only for the goats' sake, but Kim's own quality of life would be reduced by the stresses of the slaughter process. The income from meat is worth less to Kim than her feelings for the herd. Like a tree that bears fruit, the domestic goat's proliferation may depend on its cuteness or sense of humor. 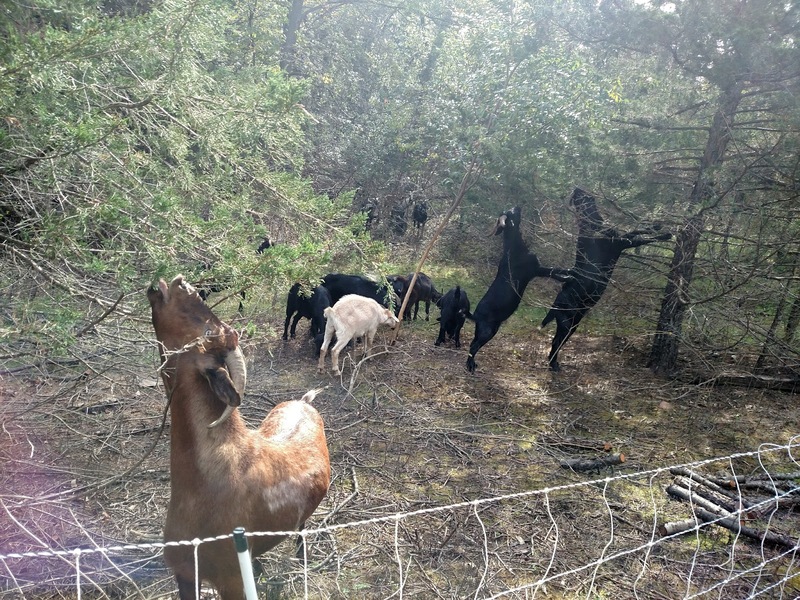 Scrublands may be natural goat habitat, with more to browse and less worms. 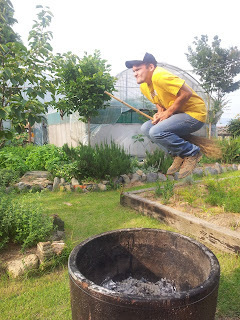 Yet Kim is sowing her pastures with alfalfa, clover and a host of grasses. 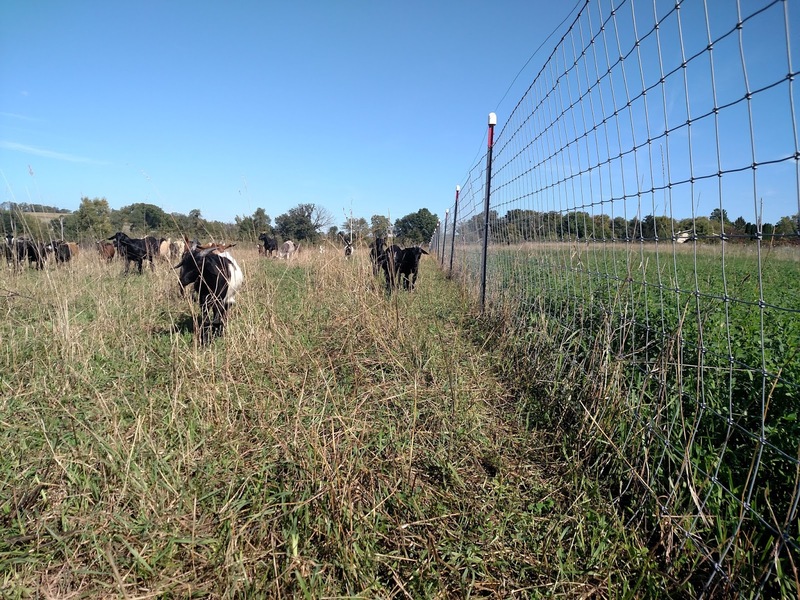 Such pastures offer easier accessibility, faster recovery, ability to mow and bail, and higher property value, compared to scrublands.